Putty Buddies are the colorful, fun way to protect your kids from swimmer's ear. Floatable Putty Buddies Earplugs really do float so they are easy to retrieve when they get dropped in the pool! These colorful, soft silicone ear plugs are larger than most other child-sized silicone ear plugs to completely fill the outer ear, providing a watertight seal over the ear canal. With an estimated 20-22 dB noise reduction, the soft silicone lets your child hear through the plug well enough that you can get your child's attention if you need to. The system using an Ear Band-it headband with Putty Buddies Ear Plugs was originally designed by an Ear, Nose and Throat Specialist for his young patients with ear tubes to help keep the Putty Buddies swimming ear plugs secure, even during vigorous activity. Each pair of Putty Buddies comes in its own sturdy plastic carry case. Available in assorted colors: red, orange, yellow, green, blue, and now pink! Putty Buddies FLOATING Colorful Soft Moldable Silicone Swimming Ear Plugs for Kids (1 Pair with Case - 7 Colors Available! )5JasonSeptember 5, 2016Great product! Works well at a great price. Putty Buddies FLOATING Colorful Soft Moldable Silicone Swimming Ear Plugs for Kids (1 Pair with Case - 7 Colors Available! )5PamJune 5, 2016Bought these for my three yer old granddaughter who has tubes in her ears. They work perfectly and do not bother her at all. The heat from her ear does cause the putty to stick on pieces of her long hair and it is difficult to remove from the hair. Working on trying to find a solution. They do keep water out of her ears and she is wiling to wear them. Putty Buddies FLOATING Colorful Soft Moldable Silicone Swimming Ear Plugs for Kids (1 Pair with Case - 7 Colors Available! )5JustineAugust 18, 2015I bought these for my 18 month old daughter who had to have grommets. These are the only product I've found that work well on tiny ears. They easily mould to fit her ears and don't fall out. They are comfortable and she is happy to wear them without trying to pull them out. We love these and won't bother with anything else now. Putty Buddies FLOATING Colorful Soft Moldable Silicone Swimming Ear Plugs for Kids (1 Pair with Case - 7 Colors Available! )5T HinkleOctober 23, 2014After my son having tubes put in our ENT recommended purchasing these ear plugs specifically. Four years later I still order and use them. Great container that seals, fits all ears, all over reliable product!! Putty Buddies FLOATING Colorful Soft Moldable Silicone Swimming Ear Plugs for Kids (1 Pair with Case - 7 Colors Available! )4LuisAugust 17, 2014These work very well, they mold easily and stay in. Make sure to wash them so they don't start smelling funky. Putty Buddies FLOATING Colorful Soft Moldable Silicone Swimming Ear Plugs for Kids (1 Pair with Case - 7 Colors Available!)5L. BodeMay 2, 2014Great product. lightweight and easily molded. will fit any ear - and it floats! Putty Buddies FLOATING Colorful Soft Moldable Silicone Swimming Ear Plugs for Kids (1 Pair with Case - 7 Colors Available! )5SandyApril 8, 2014Great earplugs, purchased for my grandsons for bathing & swimming due to ear infections. The earplugs are wonderful, easy to put in and they must be comfortable to the boys as they don't seem bothered by them. They arrived much sooner than I anticipated. Putty Buddies FLOATING Colorful Soft Moldable Silicone Swimming Ear Plugs for Kids (1 Pair with Case - 7 Colors Available! )5Jordan ZMarch 12, 2014I bought these for my son who was having tubes put in his ears to keep the water out during bath times. They came in less time than I anticipated being that they had to ship to Canada and we were able to use them for his first bath post surgery. We put them in and he was not the least bit bothered by them and they successful kept the water out! Now both my kids ask for them to be put in before getting into the tub! Love how easy they are to work with and the colours make them fun for the kids! Great product! Putty Buddies FLOATING Colorful Soft Moldable Silicone Swimming Ear Plugs for Kids (1 Pair with Case - 7 Colors Available! )5AmandaDecember 1, 2013We have been using these ear plugs since our 9 month old son got tubes. They stay in and offer great protection! The only down side is that some of the darker colors stain his ears, but other than that, I am completely satisfied. Putty Buddies FLOATING Colorful Soft Moldable Silicone Swimming Ear Plugs for Kids (1 Pair with Case - 7 Colors Available! )5HeatherNovember 27, 2013I used these all summer for the pool. They stay in so very well. They are so easy to put in that my 5 year old twins put them in by themselves. We also use them in the shower and bath tub. My kids will forget that they are even in. At home and the pool, we reuse them easily. At the beach they do get sandy but the cost is so reasonable and I buy the larger quantities in do not mind at all. Even if they don't get in the ocean, the plugs protect their ears from the sand and sea air. Putty Buddies FLOATING Colorful Soft Moldable Silicone Swimming Ear Plugs for Kids (1 Pair with Case - 7 Colors Available! )5KimAugust 24, 2013We have been using these plugs for years and they are fantastic. Long lasting and best protection you'll get. Putty Buddies FLOATING Colorful Soft Moldable Silicone Swimming Ear Plugs for Kids (1 Pair with Case - 7 Colors Available! )5Keri LewtonAugust 16, 2013My 18 month old daughter got ear tubes put in and loves to splash in the tub and also loves to go in the pool, so after much searching I found these. They are wonderful. At first she was hesitant for me to put them in, now she just knows and lets me put them in. Great product. Thanks from a happy mom! Putty Buddies FLOATING Colorful Soft Moldable Silicone Swimming Ear Plugs for Kids (1 Pair with Case - 7 Colors Available!)5B. MorrisJuly 9, 2013These work very well. My 7 yr. old had tubes this summer, so we had to keep water out. Just a drop of water in her ear causes her to scream. We had no problems, and she had swim lessons every day, was always in the pool, and they even worked at a water park. Only thing--be careful taking them out. One had a small piece break off and go in her ear. We had to have Dr. remove it. Putty Buddies FLOATING Colorful Soft Moldable Silicone Swimming Ear Plugs for Kids (1 Pair with Case - 7 Colors Available! )5BrandiJune 27, 2013These ear plugs work great. They were shipped to us very quickly. Putty Buddies FLOATING Colorful Soft Moldable Silicone Swimming Ear Plugs for Kids (1 Pair with Case - 7 Colors Available! )5Pat MurphyJune 23, 2013He's 14 months old and loves the water, he doesn't seem to even notice the plugs in his ears. Putty Buddies FLOATING Colorful Soft Moldable Silicone Swimming Ear Plugs for Kids (1 Pair with Case - 7 Colors Available! )5JennJune 21, 2013I am loving these ear plugs. We have tried others that claim to be the same but these are truly the best. My 3 yr old just had tubes put in his ears a few weeks ago and I was scared of not being able to find a perfect fit for him. We had the ENT fit him for a pair but those were not luck. I've ordered others from this site and they pop out when he jumps in the pool. But this brand fits wonderful. He hasn't had an issue yet. I highly recommend them. Putty Buddies FLOATING Colorful Soft Moldable Silicone Swimming Ear Plugs for Kids (1 Pair with Case - 7 Colors Available! )5lyonsJune 19, 2013Best ear plugs ever ! Buy them every year during swimming season for my grandson as he has tubes in his ears. They work great and he doesn't mind them at all. Putty Buddies FLOATING Colorful Soft Moldable Silicone Swimming Ear Plugs for Kids (1 Pair with Case - 7 Colors Available! )5SuzieApril 16, 2013My son has bilater ear tubes, chronic ear infections & a moderate hearing loss. Let me tell you, we have tried various different brands of ear plugs & these are by far the only ones that keep water out of his little ears. Putty Buddies FLOATING Colorful Soft Moldable Silicone Swimming Ear Plugs for Kids (1 Pair with Case - 7 Colors Available! )5AMApril 16, 2013My son recently had tubes put in, so this was a new need for us. Ordered 6 pairs to have extras on hand and they have been great! My older son uses them too, just because his little brother wears them. Easy to put in & they stay in while taking a tub. Look orward to using them at the pool this summer. Great product! Putty Buddies FLOATING Colorful Soft Moldable Silicone Swimming Ear Plugs for Kids (1 Pair with Case - 7 Colors Available! )5ErinMarch 11, 2013When my daughter got tubes, I bought a huge assortment of ear plugs to determine which ones would work best for her little ears. She was almost 2 at the time and all the other plugs we tried were too big or fell out even though they appeared to be small enough. Putty buddies stayed in place and stayed sticky for multiple uses. I also love that they float and are easy to find in the rare instance that my child knocks one out. They stay in so well that they sometimes leave some silicone residue behind in her ears, but that is a tiny matter considering how awesome putty buddies work. Putty Buddies FLOATING Colorful Soft Moldable Silicone Swimming Ear Plugs for Kids (1 Pair with Case - 7 Colors Available! )5hamamamaOctober 22, 2012I have been using these for years, after my ENT in Japan turned me on to them. They are an excellent product. 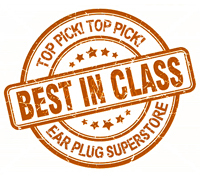 Also, the Earplug Superstore's prices and service are great. For around $15, which included shipping, I have 10 colorful new pairs of Putty Buddies. Hooray! Putty Buddies FLOATING Colorful Soft Moldable Silicone Swimming Ear Plugs for Kids (1 Pair with Case - 7 Colors Available! )5JoanneAugust 3, 2012After having an ear infection I use these frequently, not only for showering, and swimming, but at the hairdresser, too! Putty Buddies FLOATING Colorful Soft Moldable Silicone Swimming Ear Plugs for Kids (1 Pair with Case - 7 Colors Available! )5Az momAugust 1, 2012My son has tubes in his ears. The molded ear plugs cost $40 a pair at the doctors office and they grow out of them in 3-6 months. These ear plugs work just as well and grow with your child. I order a year supply at a time. Best value!!! Putty Buddies FLOATING Colorful Soft Moldable Silicone Swimming Ear Plugs for Kids (1 Pair with Case - 7 Colors Available! )5KFJuly 28, 2012This product is a little more pliable, and easier to mold, than other silicone ear plugs for kids and it fits well. We've used it once so far and its a great product! Putty Buddies FLOATING Colorful Soft Moldable Silicone Swimming Ear Plugs for Kids (1 Pair with Case - 7 Colors Available! )5RitaJuly 26, 2012Baby isn't too excited about them but they work great! Putty Buddies FLOATING Colorful Soft Moldable Silicone Swimming Ear Plugs for Kids (1 Pair with Case - 7 Colors Available! )5CindyJuly 19, 2012After many ear surgeries, I now have tubes in both ears for the rest of my life. After much frustration with other products, my husband was determined to find something that would work. HE FOUND IT! Along with the headband I was able to go swimming for the first time in many years. I no longer have to worry about a single drop of water. It was great. Highly recommended for kids and adults too! Putty Buddies FLOATING Colorful Soft Moldable Silicone Swimming Ear Plugs for Kids (1 Pair with Case - 7 Colors Available! )5TammyJuly 19, 2012These are wonderful!! My 3 yr old has tubes and I was having a difficult time finding plugs that stayed. These stay in with all the jumping, sliding, and fun he has in the water. It gives me peace of mind as well. I also purchased the Ear Bandit for added protection. Best purchase combo!!! Putty Buddies FLOATING Colorful Soft Moldable Silicone Swimming Ear Plugs for Kids (1 Pair with Case - 7 Colors Available! )5MichelleJuly 16, 2012I am extremely pleased with the putty buddies! And super fast delivery... I purchased 6 pair to spread out among my family. They are a hit! Putty Buddies FLOATING Colorful Soft Moldable Silicone Swimming Ear Plugs for Kids (1 Pair with Case - 7 Colors Available! )5BlaineJuly 8, 2012These are GREAT! Putty Buddies FLOATING Colorful Soft Moldable Silicone Swimming Ear Plugs for Kids (1 Pair with Case - 7 Colors Available! )5EricaJuly 5, 2012I Love these earplugs!!!! my son is 4 and has been wearing them for the last 3 years since he has had tubes put in. They mold to his ears and stay in all day as he is outside in and out of the pool and being a boy!!! Best product for my sons comfort and he can hear with them in too!!!! Putty Buddies FLOATING Colorful Soft Moldable Silicone Swimming Ear Plugs for Kids (1 Pair with Case - 7 Colors Available! )5DanJune 29, 2012My daughter has been wearing them for 9 years. Only ones she likes. Putty Buddies FLOATING Colorful Soft Moldable Silicone Swimming Ear Plugs for Kids (1 Pair with Case - 7 Colors Available! )5Anita WrightJune 13, 2012So far they are working great! They stay put where other types tend to fall out quite a bit. The only issue I have is that when my children remove them they leave a little bit of the ear plug in their ears! Putty Buddies FLOATING Colorful Soft Moldable Silicone Swimming Ear Plugs for Kids (1 Pair with Case - 7 Colors Available! )5Teresa owner of Still WatersJune 10, 2012I've repeatedly ordered Putty Buddies in bulk for the past 5 years and I'm so happy with this high quality product. Ordering is easy and the shipments are always prompt. My business offers float therapy and I give these colorful earplugs to our customers. I like that each pair have their own carry case. I encourage my customers to hold onto them to reuse for their next float session. Putty Buddies FLOATING Colorful Soft Moldable Silicone Swimming Ear Plugs for Kids (1 Pair with Case - 7 Colors Available! )5Sophie's momJune 4, 2012These work awesome!!! I bought these for my 19 month old baby and she let's me put them in with no fussing and doesn't try to take them out. I highly recommend them. Putty Buddies FLOATING Colorful Soft Moldable Silicone Swimming Ear Plugs for Kids (1 Pair with Case - 7 Colors Available! )5Ann MarieMay 29, 2012The best product for kids with tubes in their ears! We have tried many brands but this is the best by far. We have used this brand for several years now. Putty Buddies FLOATING Colorful Soft Moldable Silicone Swimming Ear Plugs for Kids (1 Pair with Case - 7 Colors Available! )5SherryMay 14, 2012This product is great! I actually ordered 10 pairs so we were able to disperse them to family members that have pools so we never forget a set at home! My 9 year old can put them in herself and they don't cause her any pain! Putty Buddies FLOATING Colorful Soft Moldable Silicone Swimming Ear Plugs for Kids (1 Pair with Case - 7 Colors Available! )5BobbieMay 10, 2012I would give this product a 5 star rating. My granddaughter has been using them for about 1 year now and they are great. Because she is petite, we can get two pairs out of each set. This makes an inexpensive product even better! Plus they don't hurt her ears like the other brands. Putty Buddies FLOATING Colorful Soft Moldable Silicone Swimming Ear Plugs for Kids (1 Pair with Case - 7 Colors Available! )5Mrs.KMarch 31, 2012These stay on while my daughter swims! We use them with the ear/head band to keep them in place while she is in the water They are very easy to put on as well as take off. Now she likes to wear them even when I wash her hair at home (not for swimming) because they keep the water off her ears. Also I ordered several of them in different colors.....they are just the BEST! Putty Buddies FLOATING Colorful Soft Moldable Silicone Swimming Ear Plugs for Kids (1 Pair with Case - 7 Colors Available! )5MollieMarch 23, 2012I bought these for my 18 month old after she had tubes in her ears. They work great! She doesn't mind them too much either. Would recommend. Shipping was fast too! Putty Buddies FLOATING Colorful Soft Moldable Silicone Swimming Ear Plugs for Kids (1 Pair with Case - 7 Colors Available! )5NikkiFebruary 7, 2012We've used these for over a year now... I love that they are reusable and each have their own case. My daughter has not been able to swim or take showers with ear plugs almost all her life (she's nine); even wore them for her baptism! We've tried several different kinds of ear plugs, even paid to have some specially made for her ears but the putty buddies have worked the best and she loves them! Since they each have their own case we leave a pair at family/friends home to make sure she's never without them. They are so easy for her to use and really do have a watertight seal. Putty Buddies FLOATING Colorful Soft Moldable Silicone Swimming Ear Plugs for Kids (1 Pair with Case - 7 Colors Available! )5MichelleFebruary 6, 2012I bought these last year for my daughters. They not only use them in the pool but in the shower as well. Putty Buddies are the best brand that we have tried (and we've tried a lot). Putty Buddies FLOATING Colorful Soft Moldable Silicone Swimming Ear Plugs for Kids (1 Pair with Case - 7 Colors Available! )5EmmaDecember 30, 2011These are great earplugs. I bought them for my 6 year old who had to have tubes put in his ears. I just ordered my second batch. He loves them and the little case is great for sending to camp, or to take swimming. Fabulous product and great, fast service. Putty Buddies FLOATING Colorful Soft Moldable Silicone Swimming Ear Plugs for Kids (1 Pair with Case - 7 Colors Available! )5CeceliaSeptember 9, 2011I love the fact they stay in her ears better than silicon ones that we got from her ear doctor. And the headband was great too when she goes swimming. Putty Buddies FLOATING Colorful Soft Moldable Silicone Swimming Ear Plugs for Kids (1 Pair with Case - 7 Colors Available! )5CindyAugust 17, 2011Love them. Works very well at keeping water out. Can use one pair many times before they loose their stick. Other kinds are just too stiff and do not adhear. These stay put even when jumping in deep water. Putty Buddies FLOATING Colorful Soft Moldable Silicone Swimming Ear Plugs for Kids (1 Pair with Case - 7 Colors Available! )5AndreaAugust 12, 2011I have been using these ear plugs for over 4 yrs. Both my children (boy and girl) have tubes. I looked everywhere and spent tons of money even at the ENT plugs that did not stay in my childrens ears. This work great. I split them in half and put them in my kids ears they work great!! I highly recommend them. My son has been using them since he was 1 and he is 5 now they work awesome. My daughter started using them at 1 and is now 2. Putty Buddies FLOATING Colorful Soft Moldable Silicone Swimming Ear Plugs for Kids (1 Pair with Case - 7 Colors Available! )4SarahAugust 5, 2011I've got a 9 year old daughter and they fit her perfect! Am very happy with my purchace! Putty Buddies FLOATING Colorful Soft Moldable Silicone Swimming Ear Plugs for Kids (1 Pair with Case - 7 Colors Available! )5Marianna CJuly 27, 2011I have been using them with my baby since he was 1 month old (you can adjust the size) and they are always shipped super fast!!! Higly recomended!! Putty Buddies FLOATING Colorful Soft Moldable Silicone Swimming Ear Plugs for Kids (1 Pair with Case - 7 Colors Available! )4NancyJuly 25, 2011They are great! My only complaint (and the reason I didn't give it 5 stars) is that when they do come out and get wet (and once and a while they do), they don't stay in again. Thankfully, I purchased more than one set so I can always insert another pair and let the wet ones dry. The best part of these is that they float! We have used the clear silicone ones for years and always spend time searching the bottom of the pool if one fell out, now we don't have to! Oh, and the bright colors definately make them easy to find when they do fall out. Putty Buddies FLOATING Colorful Soft Moldable Silicone Swimming Ear Plugs for Kids (1 Pair with Case - 7 Colors Available! )4Cathy StoreyJuly 23, 2011These ear plugs are colorful and easy to use. I ordered them for my 6 year old granddaughter. She loves the colors and the cute containers the ear plugs come in. The price is reasonable and I love that they float. The only criticism I have is that they seem to come out too easily when she is swimming, but at least they float and because of the bright colors are easy to find. Putty Buddies FLOATING Colorful Soft Moldable Silicone Swimming Ear Plugs for Kids (1 Pair with Case - 7 Colors Available! )5TaraJuly 16, 2011Great item!!! Works great my 6 year old is able to put them in herself and she loves the colors and animal names on the cases!! Highly recommend!!!! Putty Buddies FLOATING Colorful Soft Moldable Silicone Swimming Ear Plugs for Kids (1 Pair with Case - 7 Colors Available! )5KellyJuly 15, 2011These earplugs worked better than any we have tried! My son would always lose at least one every time that he went swimming. He was able to use one pair of these for 5 days! They stayed in his ears unlike the other brands. Putty Buddies FLOATING Colorful Soft Moldable Silicone Swimming Ear Plugs for Kids (1 Pair with Case - 7 Colors Available! )5AmberJune 28, 2011I love these for my son! He had tubes in his ears and our ins wouldn't cover the doctors plugs, which were going to cost $125!!! So glad I found these! My son loves them too!! Putty Buddies FLOATING Colorful Soft Moldable Silicone Swimming Ear Plugs for Kids (1 Pair with Case - 7 Colors Available! )5JaymeJune 23, 2011My son will not keep anything in his ears.. until we discovered Putty Buddies. Thank you for making our lives easier!! Putty Buddies FLOATING Colorful Soft Moldable Silicone Swimming Ear Plugs for Kids (1 Pair with Case - 7 Colors Available! )5bkelsoJune 22, 2011These are the best ear plugs. I get 4 'ear buddies' out of 1 pair. I only use one ear plug and divide it in half, and that is great for my little ones ears!!! So it is like getting 2 for the price of 1!!!!! Also, if taken care of, they last a VERY long time. And another great thing about them is, they DO float!!!!! Putty Buddies FLOATING Colorful Soft Moldable Silicone Swimming Ear Plugs for Kids (1 Pair with Case - 7 Colors Available! )5KellyJune 14, 2011These by far are the best ear plugs for swimming. My 7 year old loves their colors & fun cases. Mom loves there ease of placing in the ears & effectiveness. Even if they get wet they are easy to get in again. My Father who doesn't like his ears getting wet now uses them too! Putty Buddies FLOATING Colorful Soft Moldable Silicone Swimming Ear Plugs for Kids (1 Pair with Case - 7 Colors Available! )5Ashley EvansJune 7, 2011I use these for my daughter who has ear tubes! They work great!!! Putty Buddies FLOATING Colorful Soft Moldable Silicone Swimming Ear Plugs for Kids (1 Pair with Case - 7 Colors Available! )5JessicaJune 1, 2011These are great I will not buy any from dept. stores again. Putty Buddies FLOATING Colorful Soft Moldable Silicone Swimming Ear Plugs for Kids (1 Pair with Case - 7 Colors Available! )5AileenMay 29, 2011I got these ear plugs for my almost 2 year old. She has tubes in her ears so keeping out the water while she is swimming is priority. I love these. You can mold them smaller to fit any size ear and they stay put! Putty Buddies FLOATING Colorful Soft Moldable Silicone Swimming Ear Plugs for Kids (1 Pair with Case - 7 Colors Available! )5Eleanor VaughanMay 24, 2011Fantastic product no more cottonwool and vaseline for my son, he's thrilled. So easy to use and store, attractive to kids. He can't wait to go swimming with them. Putty Buddies FLOATING Colorful Soft Moldable Silicone Swimming Ear Plugs for Kids (1 Pair with Case - 7 Colors Available! )5JenniferMay 17, 2011These ear plugs are great. My daughter has ear tubes and these are the only plugs that stay in her ears. They mold easily to her ears and they stay in place with the head band. I bought one of every colour and she loves them all. Putty Buddies FLOATING Colorful Soft Moldable Silicone Swimming Ear Plugs for Kids (1 Pair with Case - 7 Colors Available! )5GerriApril 10, 2011They work great. My child was scared at first, but got over it quickly and now likes them. Putty Buddies FLOATING Colorful Soft Moldable Silicone Swimming Ear Plugs for Kids (1 Pair with Case - 7 Colors Available! )5ReneeMarch 22, 2011They work great. Easy for the kids to use. Bright colors are easy to spot if dropped in the pool. Inexpensive. Putty Buddies FLOATING Colorful Soft Moldable Silicone Swimming Ear Plugs for Kids (1 Pair with Case - 7 Colors Available! )5NancyMarch 17, 2011My son has been using them for years now and has not had an ear infection since. He swims competitively and is in the pool all the time. Putty Buddies FLOATING Colorful Soft Moldable Silicone Swimming Ear Plugs for Kids (1 Pair with Case - 7 Colors Available! )5janeMarch 16, 2011I totally recommend this product to anyone with little ones who frequently go swimming. The colors are attractive and fun for kids. Putty Buddies FLOATING Colorful Soft Moldable Silicone Swimming Ear Plugs for Kids (1 Pair with Case - 7 Colors Available! )5MeganMMarch 6, 2011Great product and delivered promptly to Australia. Love them! Putty Buddies FLOATING Colorful Soft Moldable Silicone Swimming Ear Plugs for Kids (1 Pair with Case - 7 Colors Available! )5NearkFebruary 19, 2011great love them finally a plug my 3yr keeps in! order arrived fast! Thanks! Putty Buddies FLOATING Colorful Soft Moldable Silicone Swimming Ear Plugs for Kids (1 Pair with Case - 7 Colors Available! )5EarIssues-No MoreFebruary 10, 2011I've used these ear plugs on my 1-2 yr old, post ear tubes surgery. Use for baths and swimming. Just bought our second round of a 5-pack! They are great, flexible yet hold in place. Ears are dry and reuseable many times before you have to toss them out! the headband is great for swimming at a pool / lake and I highly recommend getting one. Band not needed for baths at home! Best product on the market imo ! Putty Buddies FLOATING Colorful Soft Moldable Silicone Swimming Ear Plugs for Kids (1 Pair with Case - 7 Colors Available! )4MichelleJanuary 11, 2011My 5 year old daughter has just had tubes put in her ears. To keep the water out at bath time, we order the ear putty. It's very easy to use & remove! The only problem, I ordered 3 sets...they sent 3 different colors, so choosing which one for bath night can be challenging :-) I even recommended this site to her ENT specialist!